You might have heard this little tip before but we really encourage you to try it. It will make it so much easier to eat well throughout the week, also when you have no time to spare. Always, always cook twice as much quinoa, millet, buckwheat, beans and lentils as you need for a recipe and store the leftovers in separate containers in the fridge. We can guarantee that they will prove themselves useful throughout the week. 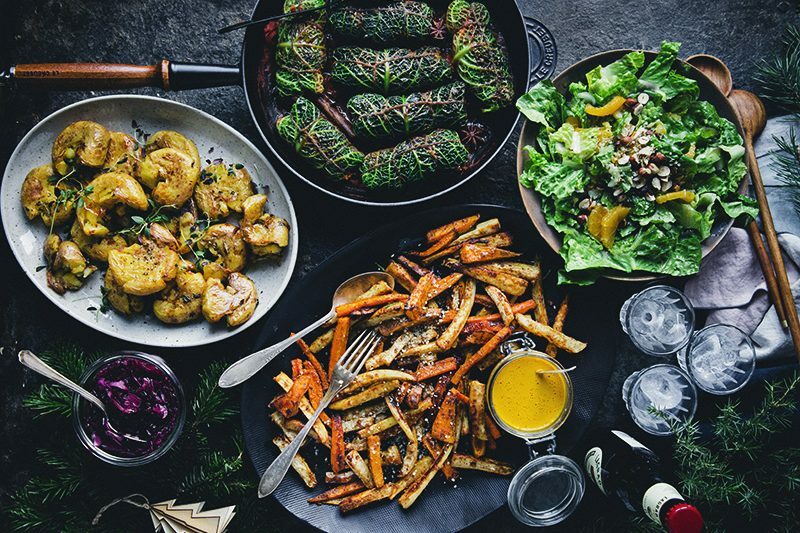 You will quickly realise how helpful it is to always have something readily available to add in salads, as a side to a stew or on top of soups. 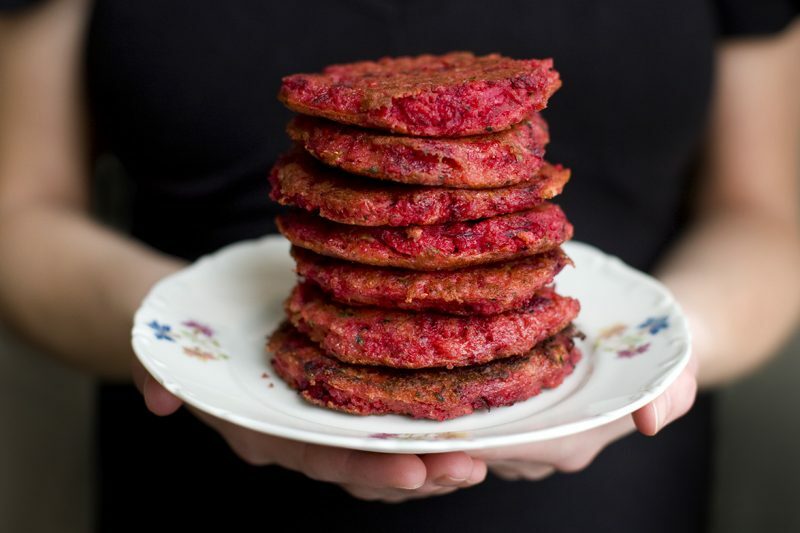 And if you run out of ideas, you can always make patties. 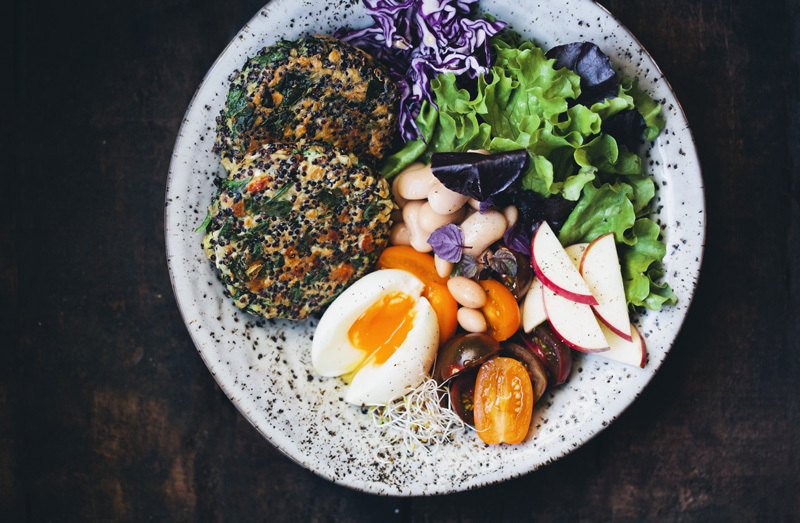 We make these Spinach & Quinoa Patties quite often, using leftover vegetables from the fridge together with some seeds or grains. They are great in a burger bun, but most of the time we add them to a bowl like the one above. These bowls full of vegetables, beans or lentils, grains or seeds and some kind of fruit are very typical in our house. They are quick to make, easy to vary according to season (just like Sarah B does) and always delicious. We also created this video for our youtube channel to show you how it looks when we make these patties. Hopefully you will find it helpful. If you look closely towards the end of the clip, you can see that Luise still was pregnant when we recorded it. In fact, it was only days before she gave birth to baby Isac. PS! Exciting news! 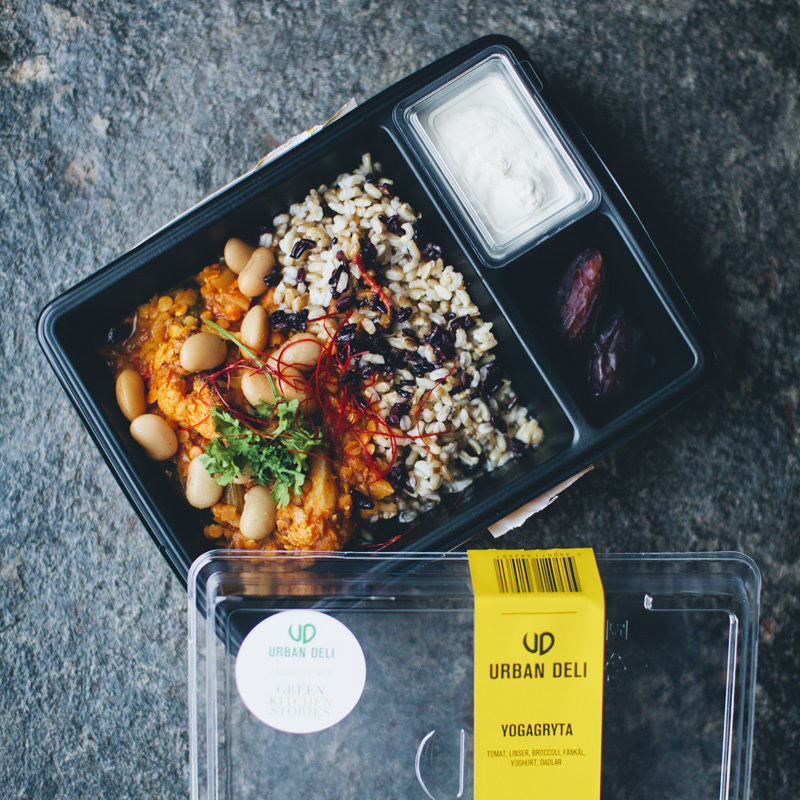 You can now pick up our Yoga Pot as a to-go box in any of the four Urban Deli stores in Stockholm. We have worked together with their chefs to make it taste perfectly and it truly turned out good. If you don’t know our Yoga Pot already, it’s a flavorful red lentil and vegetable stew served with whole grain rice, some yogurt and two fresh dates on the side. So now you know where to go if you are in Stockholm and feel like eating a GKS meal at home but don’t want to cook it yourself. Yay! Yum looks so delicious. When do you start selling these ready made treats overseas? It's so hard to find healthy tasty food in the Philippines! Hi guys! Would it work to replace the oats by quinoa flakes you think? How beautiful! 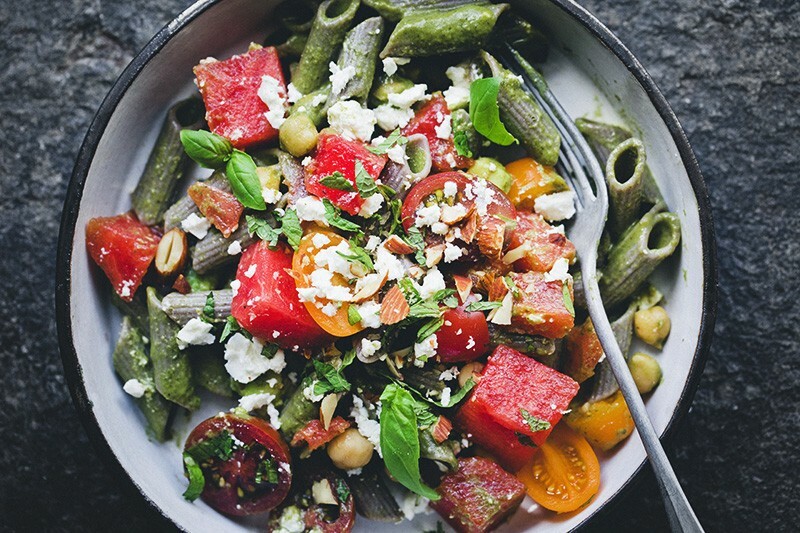 I can't resist a gorgeous, colorful meal in a bowl. Just made these and they are delicious :-) amazing!!! So delish! Made last night and brought to work for lunch today with roasted eggplant and carrots. 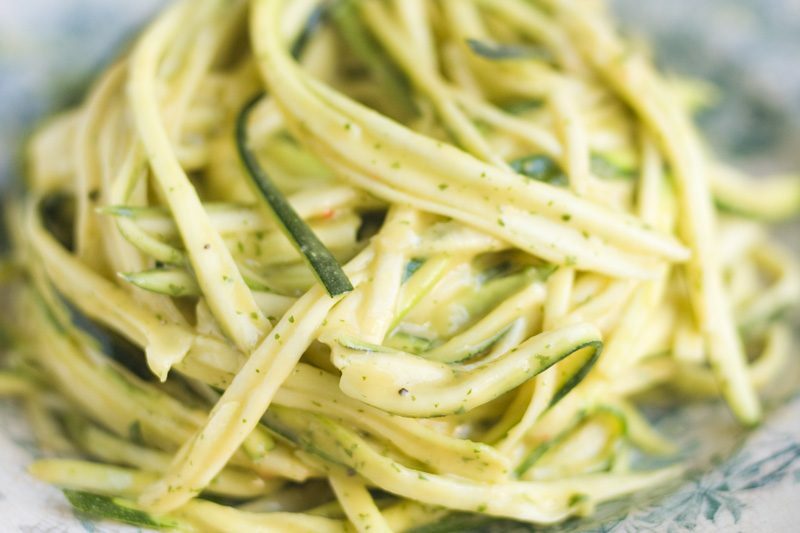 Have you tried the recipe with pumpkin puree or sweet potato instead of spinach? I think I will try that next. Such pretty little patties! These look great! 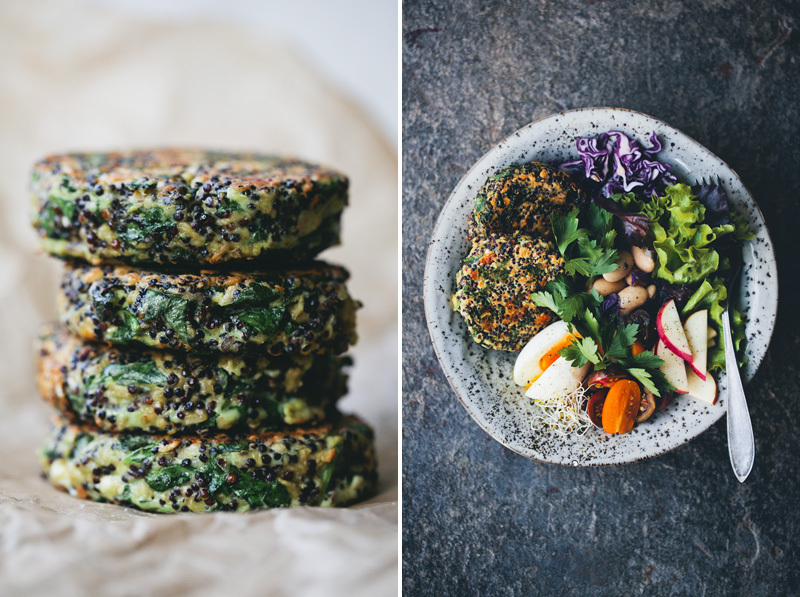 I love quinoa patties and make them every now and then. They're so versatile and packed with flavor! I can see me making these for lunch or dinner next week. Thanks for sharing the recipe and your wonderful video! This looks great! I love the different textures and colours you've got going on there. Congratulations o your collaboration with UrbanDeli. Cant wait to make them! Would it still work if we bake instead of fry? We tried similar patties with less eggs the other day but it was hard to make them hold together without keeping them small. Will try yours to see the difference. Bon appétit! They look amazing! I am definitely going to try them! How long can you keep precooked quinoa, beans, lentils etc. in the fridge? These look incredible- and the bowl together is my favorite kind of meal. I have to admit, your's looks prettier than mine usually turn out! I'd love to be able to buy GKS food as take out! Can you pitch it to a restaurant here in Kuala Lumpur?? I always cook more and patties are the first option for a quick meal. Your video is so nice, and I'm totally in love with your bowls! Love this, as always! Feta and spinach have that mediterranean flair together :) Your videos are such a pleasure to watch. And it's so cool that your yoga bowl made it to the shelves of UD! I wonder if there'll be more from you? Looks delicious and I loved the video! This looks amazing! I love how easy the patties seem. I can definitely foresee myself making them on a regular basis! These look delicious! I just wonder - the patties in the photos have something orange that looks like maybe carrot, or sweet potato...what is that?? Your patties are so perfect! I am just shooting for mine to taste yummy...here goes nothing. Happy Nesting.